Here's a first peek at what I've been putting together for Austin's first birthday party. I can't believe our little boy is turning one in less than 2 months. Time really flies. To celebrate, we're planning a small get-together with some family and friends in our courtyard. Hopefully the weather doesn't get too hot; it's hard to predict in May. We didn't have a theme in mind when we first started planning his party. And now that we're further along the planning process, we still don't have one. Coming from design backgrounds, both Gary and I are obsessed with typography, colors and composition, so we decided to use those as our guiding elements. For favors, we have something special for the kiddos which is a secret for now. For the adults, we're giving out my favorite organic lollipops from Yummy Earth. To give these a special touch, I designed a cute, typography iron-on (which you can find them here) to be applied to some handmade muslin bags. I hope our guests like them. Here's a quick tutorial on how I made the favor bags. 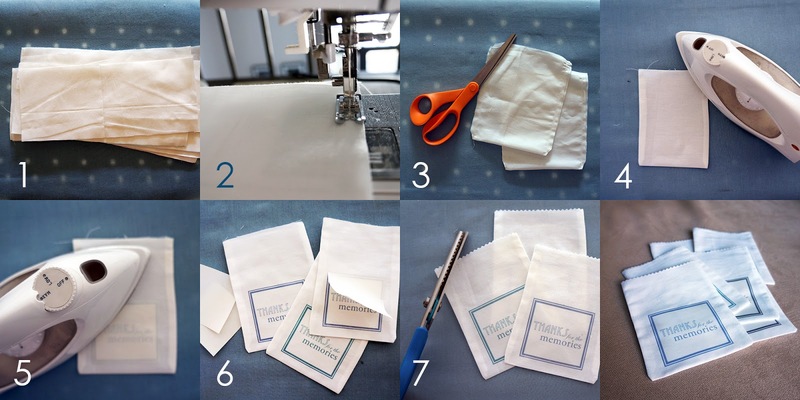 Cut muslin fabric to 5" x 12" pieces (or whatever size you need the bag to be). Fold the fabric piece in half to make a 5" x 6" rectangle. Sew along the two longer sides, leaving an opening on the short side. Clip the inside corners before turning out the bags. Then iron on the decals onto the bags according to the manufacturer's directions. Remove the backing of decals. Take pinking shears and trim the edge of the opening to create the zig-zag edge. Yay! There you have it, some handmade muslin favor bags.